The stockings are barely hung in the house before my youngest daughter starts creating things to place inside each one. Casually walking by the fireplace on any day, she’ll gently squeeze the bottom of a stocking so the rest of us can hear the crinkling of paper inside, a creation she has made for one of us with great intention. The joy on her face tells us that she is just as excited about giving these love notes and creations as we will be to receive them. This year, my family is balancing changes in the air. Among the changes is the fact that we are without a dog in the house for the first time in many, many years and we are missing our sweet Lenny, as well as people, circumstances, and easy decisions. Perhaps because of these realities, perhaps because her love just couldn’t be contained to stockings this Advent season, my youngest also made and wrapped gifts that are already under the tree. Honestly, it had been one heck of a day. I was overjoyed for a moment of sweetness. I peeled back the paper and crumpled bits of red and green paper fell all over my lap. “It’s big and fluffy confetti, Mom.” Giggles and joy. 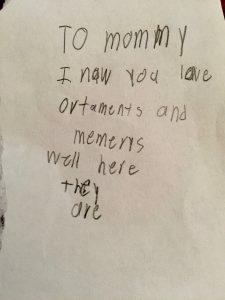 To Mommy – I know you love ornaments and memories…well, here they are. I remember getting candy canes at the Christmas tree shop. I remember when I was decorating a gingerbread cookie and I got icing all over my fingers. I remember how much we love dancing to Carol of the Bells. I remember how we make each other laugh. I remember how we like to buy presents for other people. I read every word. I thanked her. In the giving, my daughter reflected to me what I tell and show her is important to me about this season. At the same time, she shared her memories of past Christmas seasons and her hopes for this one. She was right…it was indeed a gift I needed to open before Christmas. 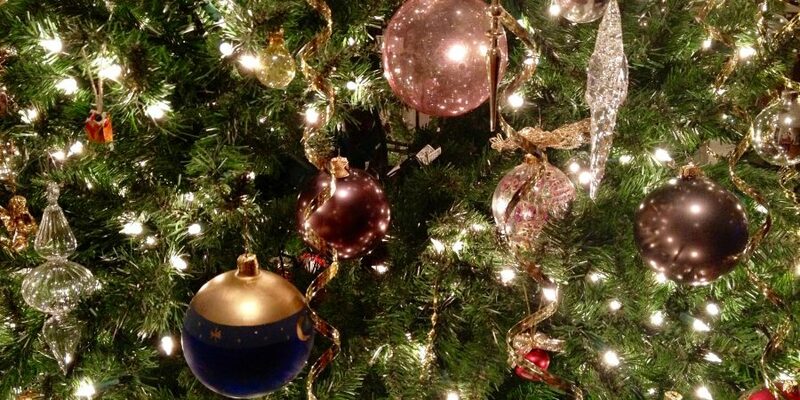 As a child, I was fascinated by the story of the star that shone brightly over Bethlehem. I was amazed that it showed people the path to follow and grateful for the light and mystery it created. To this day, any pageant service with a star held above the manger scene reminds me of how I felt as a child. As an adult, the star is a reminder of the Light – how we find it, how we create it, and, most importantly, how we choose to share it. The mystery and awe is the same. What shines for you in this season? Chances are the best gift is time spent with another, a quiet walk looking at lights, a hug, a handwritten letter or homemade ornament, reminding someone of their love language and sharing your own. To be and create light in this sometimes dark world is the beginning and the ending. In this last week of Advent, my wish for you (whatever you may or may not be celebrating) is the love that goes into a handmade ornament, a note for or from someone you love, the heart of a child, and calm space and an open heart so you might see and feel all of these things. Years ago, my godmother sent me this quote, taped onto the front of a card. When I pack up Christmas decorations each year, I pack it away so that I will find it all over again the next year. Perhaps you will keep it with you this week to remind you to breathe, look around, slow down, and consider what shines around you that doesn’t have to be bought. This great Light is not found in a store because it is already around you just waiting for you to see it, reflect it, and pass it on. These are such tender, beautiful Christmas words. They can be posed against some of the things we could be discouraged about this season. They brought light, and I’m grateful. This was absolutely amazing my friend! Thank you for sharing. It touched and warmed my heart deeply.